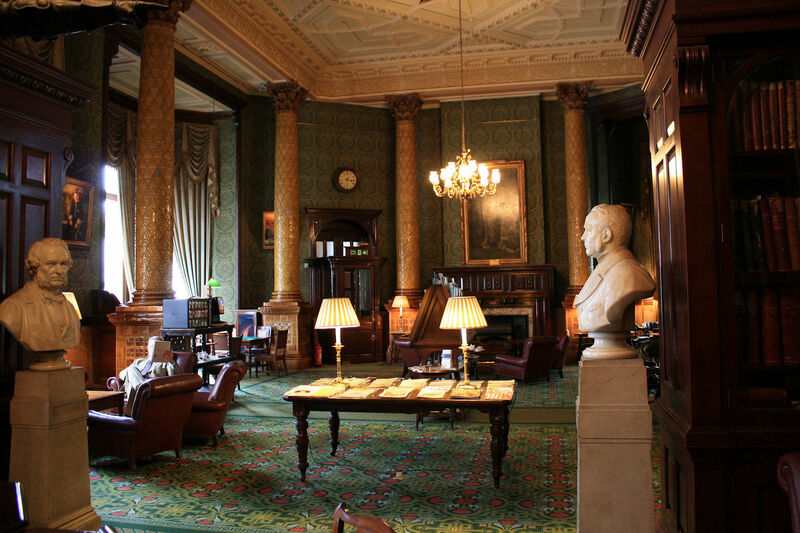 Whereas the National Liberal Club, a neo-Gothic gentlemen’s enclave commissioned on the Victoria Embankment by Gladstone, seems to epitomize the establishment. The Grand Old Man himself would have recognised the waiting staff’s steady service, the ceramic walls and columns, and the braised beef and carrots. I began to wonder whether the society had misunderstood Algernon  when he advocated being serious about meals. 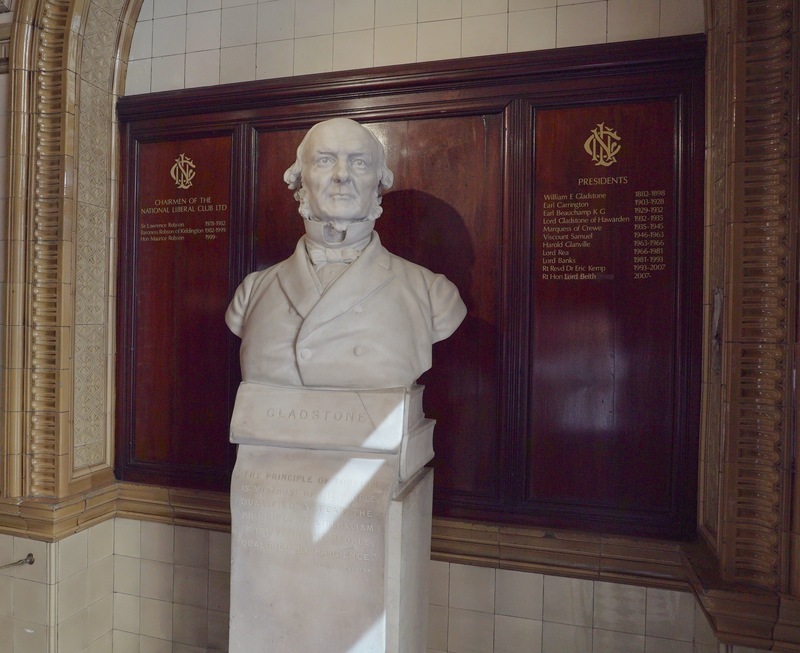 Moreover, instead of Wilde in wax, here was Gladstone in granite, his statue validating the verbal analogy of being part Gradgrind and part Murdstone. But if this all sounds too Dickensian in the direction of hard times, be reassured. The proverbial good times were had by all. The evening turned out to be eminently friendly and clubbable; far more Pickwickian, in fact. It was a reminder for Wildeans, should they need it, that the establishment often triumphs in the end. The only glitch was that the planned drinks at seven in the Smoking Room were pre-empted by other events in that stately space on a busy night. Still, I could not resist a pre-prandial peek through the window to see Gladstone’s axe on display along with a chest made from an oak tree he had felled. And in a similar act of taking down and wooden thinking, the room was also the scene of a Jeremy Paxman interview in which he inadvisably questioned the sobriety of the late Liberal leader Charles Kennedy. This latter thought made for a cautionary segue into the evening’s main event. The Society’s chairman, Don Mead, heralded proceedings with his customary aplomb, speculating that if Oscar were in attendance for this, his 163rd birthday, he would still probably only admit to 161. It was also pointed out for those not attuned to such numeracy (unlike myself who had already noticed), that the back of the menu cleverly contained a remark made by Wilde on this very date, October 13th, back in 1890. The quotation in question was taken from a manuscript on Tite Street notepaper (not the actual fragment, you understand, just an image of it) of a line from The Critic as Artist, being Wilde’s assertion that a sense of colour is of more importance than a sense of right and wrong — a line that proved to be a useful rejoinder to comments about my wardrobe’s tendency towards the criminal. It then fell to Robert Whelan to propose the toast, but not before reminding us that in London we were currently in the midst of an Oscar Wilde season. Robert underscored Wilde’s achievement by noting that staging seasons of plays is a tricky business — if one fails the season generally fails — and not even Shakespeare had managed to occupy a London theatre for a whole year. More power to Oscar we all thought, this no doubt being Mr Whelan’s drift. Geoff Dibb introduced the evening’s speaker, Dr Rebecca N. Mitchell, Senior Lecturer in Victorian Literature and Culture at the University of Birmingham, who gave a scholarly reading, rather than an after-dinner talk, on the subject of ‘Editing Oscar Wilde: Tales of the Oral Tales’. Dr Mitchell is no stranger to editing Wilde’s work, having co-authored studies of Wilde’s notebook on Thomas Chatterton and the newly-recovered fair copy manuscript of The Decay of Lying. She is also co-editing volumes X and XI of the Oxford English Texts edition of the Complete Works: Unpublished, Incomplete and Miscellaneous Works. Dr Mitchell explained how manuscript evidence is at the heart of any editorial project, and that it invariably tells us something about an author’s process. In Wilde’s case, the study revealed a consummate professional beneath a veneer of idleness, or as our speaker elegantly phrased it: ‘the dedicated labour that Wilde put into to his works pricks the soap bubble of effervescent ease that he worked hard to sustain’. The reason for emphasizing the editorial process, she said, was to place into perspective the difficulty of analyzing Wilde’s spoken tales, which, naturally enough, tend to lack such textual authority. In this respect Dr Mitchell expressed gratitude to the Society’s Thomas Wright for his scrupulous work on Wilde’s table talk. Despite the documentary challenges, it emerged that the spoken medium is unquestionably central to Wilde’s reputation; a reputation achieved thanks to stalwart efforts such as Ross’s compilations and Walter Ledger’s work and subsequent archive, now at Oxford. 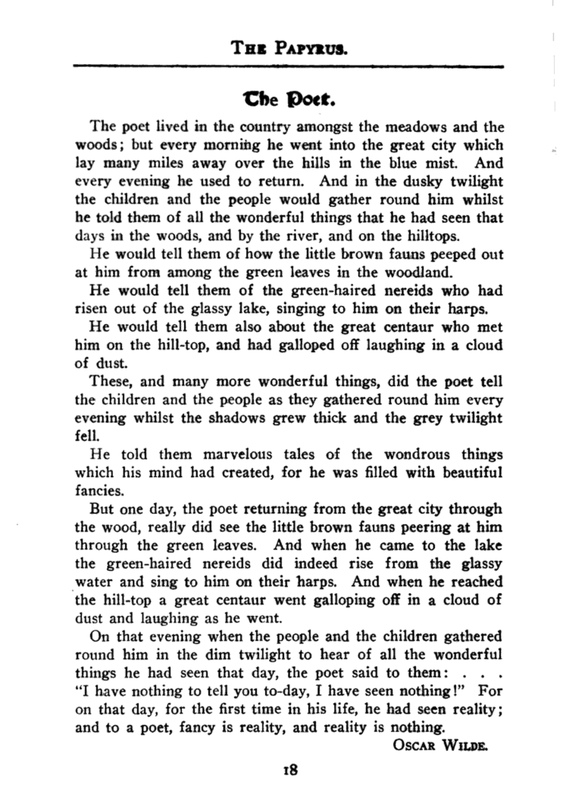 By way of demonstrating the literary process, Dr Mitchell highlighted a particular case study: that of Wilde’s vignette ‘The Poet’: a man who tells tales of brown fauns, green-haired nereids, galloping centaurs and the like, until one day the creatures actually appear to him, thus silencing his stories. The coda being that, to a poet, fancy is reality and reality is nothing; once the creatures became real, he had no more to say. The analysis of the case study constituted the main body of Dr Mitchell’s talk. She illustrated the complications of verifying the story by having to balance good intentions with suspect editorial practices. One such culprit was Léon Guillot de Saix (1885-1964), the ostensible editor of an extraordinary collection of short stories published in French and attributed to Wilde. Dr Mitchell then touched upon Wilde’s proposed publication of the story in a Paris magazine (to date unfound), his letters later in life about it, and its appearance in print in at least eight sources. 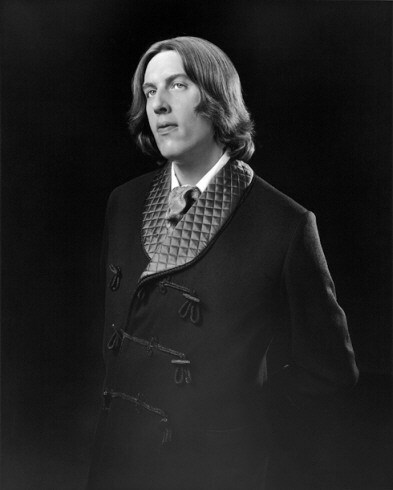 The conclusion one took was that in editing Wilde’s oral tales there are more questions than answers, something that cannot be claimed of the subsequent Q&A session in which Dr Mitchell responded knowledgeably to all of the questions raised by various members. This body of information was absorbed, it must be said, along with generous amounts of food and wine, proving two things: first that the myth of the Cadogan, like Bunbury himself, was quite exploded, and second that I might be joining them in that eventuality quite soon if I consumed any more food. Time eventually ushered in the final act and people mingled and table-hopped in traditional fashion. New friends were advisably well-met, and old friends were met well after it was advisable. Indeed, their serious side eventually started to show signs of triviality, which I suppose made for an earnestly rounded denouement. And so we toasted Oscar’s birthday and the happy returns of many more—and the promise that I’ll try not to leave it twenty years next time. * Thanks to Robert Whelan for minor corrections. The Cadogan Hotel in London was the scene of Wilde arrest by police which led to his eventual imprisonment. Algernon Moncrieff, a frivolous character in Wilde’s The Importance of Being Earnest. Reproduced in ‘The Papyrus’, A Magazine of Individuality. March 1912. Michael Monahan ed.